During the winter months many homeowners scramble to find a way to protect their roof gutters from heavy ice buildup. Icicles can also form, creating dangerous conditions for pedestrians below. Not only does falling ice present a danger, but melting icicles drip onto the sidewalk below and the water refreezes in the evening, creating a thin sheet of slick ice. Needless to say, these conditions are a nightmare for business owners. The most popular and trusted method for keeping roof gutters and downspouts free of snow and ice is installing a heat trace system. These affordable systems are easy to install and are fully automated. The reliable, maintenance free roof deicing systems rely on durable self-regulating heat trace cable. Self-regulating heat cable automatically adjusts its power output to compensate for temperature changes. The cable’s irradiated conductive core increases the heat output as the outside temperature falls and decreases the heat output as the temperature rises. This unique construction makes it durable, safe, and extremely energy efficient. The UV stabilized, flexible thermoplastic elastomer overjacket protects the durable carbon core for wet applications and exposure to the sun. These features provide more consistent performance, longer lifespan, and easier installation in cold temperatures that most other cable brands. 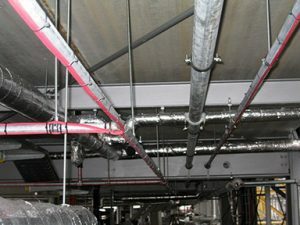 In addition to providing ideal protection for roof and gutter applications, the heat cable can also be used for pipe tracing applications. The other key component to Warmzone’s industry leading roof deicing and gutter trace system is the WS-8C aerial-mount snow sensor. This advanced sensor is designed primarily for gutter, downspout, and roof ice melting and small satellite antenna deicing. The totally sealed, low voltage, remote mount precipitation sensor allows the user to install the small sensor head in a downspout, the back of a gutter, or at the end of an antenna boom, up to 10 feet away, while keeping the main controller in a more convenient or protected outdoor location. Warmzone roof heat tracing systems are affordable and effective. And once installed, you never have to worry about it. The system automatically operates when needed. In addition to installing the cable in roof gutters, downspouts and valleys, the cable can also be zigzagged along the roof’s edge to help break up ice dams. The heat cable prevents water from pooling up behind ice dams by providing channels for the runoff to reach the gutter. However, if your roof is consistently dealing with ice dams, that may be an indication that your attic is poorly insulated. Certainly, a roof deicing system can be installed at your roof edges to eliminate ice dams, but it is also recommended that you check your attic to ensure that it is properly insulated as well. Ice dams form as a result of warm air rising from the home and escaping into the attic where it warms the roof and causes runoff. The melted snow reaches the colder roof overhang and refreezes. Eventually a ridge of ice forms and then subsequent runoff pools behind the ridge of ice. Water can seep under shingles and when it refreezes damage may occur. Warmzone can provide a variety of custom roof heating solutions for you. Call today and see what options would best suit your needs. Any system can be customized to meet your specific roof heating needs and budget. Call 888.488.9276 today. Most weather related issues for a home begin – or end – with the roof. So, it’s no exaggeration to state that the single most important physical characteristic of a house may be its roof. Trouble areas or a poor quality roof can result in expensive water damage within the house so it’s vital to catch these problems before any damage can be done. As homeowners it’s important for us to inspect and maintain the quality of the roof and consistently ensure the integrity of the roof. Multiple-layer roofs (shingles laid over shingles) will have a shorter lifespan. An unventilated or poorly ventilated attic reduces roof lifespan. Tree branches rubbing on a roof or the accumulation of leaf debris on a roof can shorten the life of roof shingles. Severe weather such as hot summers and harsh winters can affect your roof. Weather fronts that introduce dramatic temperature swings within a 24-hour period can also shorten lifespan because of the rapid expansion and contraction of the roof materials. What’s the Best Way to Heat My Roof? Warmzone offers several options when it comes to heating your roof. And each system can be customized to further meet your specific needs. The semi-conductive polyethylene heating element comes in 12-inch wide rolls and can even be nailed or stapled through and cut on site. Other widths are available for heating gutters and downspouts. The heating element is polypropylene fused during fabrication to achieve water proofing and protection from alkaline or salt damage. The ideal solution for heating gutters and downspouts is self-regulating heat cable. The heat cable is effective for heating roof edges, gutters and drainpipes to help prevent costly ice and water damage, frost erosion and dangerous falling ice. The self-regulating roof and gutter heating cable is extremely effective and energy efficient. The UL listed cable meets the requirements of the NEC (National Electric Code) Section 426. The durable cable features an irradiated conductive core that increases the heat output as the outside temperature falls and decreases the heat output as the temperature rises. This proven construction makes it tough, safe, and extremely energy efficient. Most residential automated self-regulating heat trace systems consist of the heating element and a thermostat or snow sensor (activation device). (Larger systems may require another contactor, depending upon the power requirements. Heat trace systems rely on the thermostat to activate and keep the gutters and downspouts clear of ice. Warmzone roof heating systems are fully automated and maintenance free. Warmzone roof deicing systems have been installed in Denver and most other cold regions around the country and are still the most effective and discreet for roof deicing and gutter trace applications. Roof heating systems can be customized to accommodate just about any roof type and configuration. Warmzone self-reg roof and gutter heating cable may also be combined with other recommended roof heating systems, such as the RoofHeat STEP deicing system to create an optimal solution for you. We’ll work with you to create a customized system to best accommodate your specific snow melting needs as well as your budget. For more information, call 888.488.9276 today. Each spring, it’s a good idea for homeowners to check their roofs and make sure they survived winter’s icy barrage intact. Look for damaged, loose and missing shingles, loss of granules on asphalt shingles, deterioration of the sleeves and flashing at vent pipes, and corrosion or damage of other roof flashing. (“Flashing” helps direct the flow of water around openings.) Also, take a look after any severe weather event. Roofs in cold climate areas are susceptible to gradual deterioration over the years as a result of repeated freezing and thawing of snow in areas where pockets of ice accumulates. Roof damage can be very subtle, but tiny problems can grow into large, costly problems that not only affect the roof, but the inside of the home as well. That’s why careful inspection of the roof is so important. The origins of roof problems and likely “leak points” are at its flashings (such as the drip edge, valleys, and wall-to-roof flashing). Penetrations such as plumbing vent pipes, chimneys and skylights are also more vulnerable to leaking. This means that a home with an elegant roof line that has multiple intersecting planes, a chimney and maybe a couple of dormer windows is more likely to leak than a simple gable roof on a rectangular-shaped house. Most roof leaking is the result of an event, such as a strong storm followed by a threshold of deterioration after which the material begins to fail. 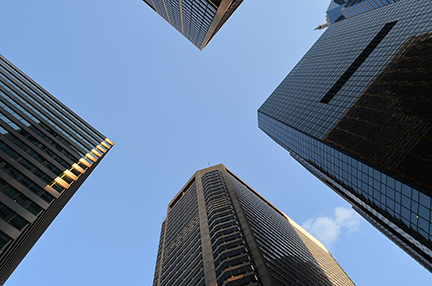 Failure points can also be a result of manufacturing or installation defects. Also, ice dams are a common culprit when it comes to roof damage and water intrusion. 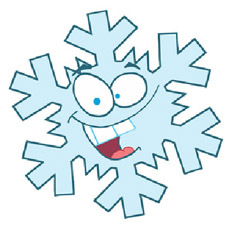 Snow and ice buildup occurs when runoff reaches the colder roof eaves and refreezes. Over time, the buildup increases, resulting in large rims of ice near the roof’s edge that cause water to pool behind it. The pooled water seeps under the shingles and refreezes at night, which can threaten the roof’s integrity and eventually lead to costly water damage inside the home. Self-regulating heat cable and low-voltage RoofHeat STEP systems are two leading solutions for heating roof edges and preventing ice dams. These automated systems keep roof edges clear of snow and ice, and the heating elements can also be installed in the roof gutters to further facilitate runoff. Ensuring that water and ice are never trapped on your roof offers peace of mind, knowing that ice dams are not threatening your home. View more information and options for heating your roof. Multiple-layer roof – A roof installed over an existing roof will have a shorter life. Attic ventilation – An unventilated or poorly ventilated attic reduces roof lifespan. Trees near the roof – Tree branches rubbing on a roof or the acidity from the accumulation of leaf debris on a roof can shorten the life of roof shingles. Harsh climate – Severe weather, including hot summers as well as harsh winters. Dramatic temperature swings within a 24-hour period also shorten lifespan because of the rapid expansion and contraction of the roof materials. To protect your roof from winter related damage, view our roof heating options page and contact a roof heating expert at 888.488.9276. What is the Life Expectancy of a Roof? The life expectancy of a roof varies, depending on the type of roofing material, the weather, and quality of the installation. With this is mind, here are some lifespan averages for the different types of roofs (based on “average” conditions). Color of Roof – A dark roof absorbs more heat, which shortens the lifespan. Angle of Roof Slope – Higher pitched roofs tend to last longer. Orientation of Roof Surface – A roof slope facing south is exposed to more UV rays than other roof facings, and therefore results in a shorter life. may be finding that the harsh winter weather has caused damage to their roof and gutters. Many people don’t give their roofs and gutters a second thought until there is a problem. Snow and ice can cause damage to roofs and gutters in many different ways. Shingles can come loose due to the contractions and expansion with the change in temperature. 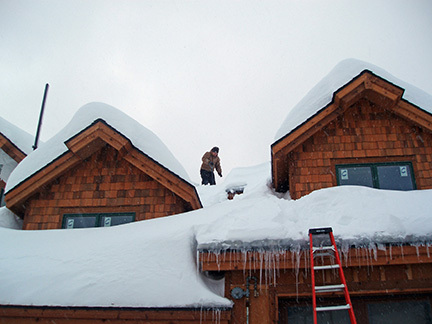 Ice dams are the most common problems associated with winter roof damage. A ridge of ice forms at the edge or valley of a roof and prevents the melting snow behind it from draining. The water backs up behind the dam where it freezes and melts again. Eventually water seeps through a weak part of the roof, causing damage to ceilings, walls, and floors, eventually resulting in mold and mildew growth. Heating the roof edges is an economical and efficient way to eliminate dangerous, and potentially costly, ice dams from forming as well as heavy ice and icicles that can damage gutters. Many people don’t realize that they can do something to prevent the damage that winter weather causes to roofs and gutters. Roof heating systems are becoming an affordable and preferred option for many homeowners. A variety of roof deicing systems are on the market today. Thin RoofHeat STEP low-voltage heating elements can be discreetly installed under the shingles and help to protect your home during the harsh winter months. This system can also be installed to heat metal roofs. Homeowners also have options to protect gutters from breaking due to ice, and also the buildup of icicles, which can be dangerous to homeowners and their families. Gutter trace systems can be installed to prevent structural damage from heavy snow and ice to gutters and downspouts. When it comes to protecting your home, Warmzone offers many roof heating options, each of which can be customized to best meet your needs. The best time to take preventive measures to guard against future roof damage is in the early spring. With the threat of heavy snow behind, most people are not thinking of what they can do to make next winter easier. This means savvy homeowners can find better deals on installation and pricing in the spring. When shopping for the best roof deicing system homeowners should take into account the following things. Ease of installation. You want a system that can be nailed or stapled though and installed and cut to fit onsite, facilitating the ease of installation. Such a system can be significantly less expensive. Does the system require maintenance? Electric roof deicing systems are preferable because they are virtually maintenance free, decreasing the cost of yearly up-keep. With an electric deicing system, there is no need for yearly checkups or repair of leaky pipes that may be associated with some hydraulic heating systems. Is it a trusted product with a reliable track record? Don’t be afraid to ask questions about the system and the heating element. Find out what other applications it has been used for. Why is it the best system for you? Is the roof heating or gutter trace system fully automated? How efficient is it? Look for a system without a bulky housing system. You also want to find a deicing system that is fully automated which will make it more effective in that the energy goes directly to snow melting. (Learn how roof deicing systems work.) This will in turn make the cost of operation per hour less. Probably the most important factor to an efficient deicing system is that it is fully automated. This should be on the top of your list of must-haves from a deicing system. A fully automated system can detect the temperature and moisture in the air, and when conditions warrant, it triggers the control unit. The controller then powers up the heating elements warming your roof and gutters just before the snow storm and then shutting off afterward the storm has passed, resulting in maximum performance. Installing a roof deicing system is an excellent way to prevent damage to your roof and gutters from winter weather. As long as you know what to look for, it is a safe, affordable way to protect and raise the value of your home. We see this phenomenon in almost every neighborhood in New York, New York; dangerous icicles forming on the roofs of our homes and our neighbor’s homes. The need for a roof snow melting system always seemed like a good idea, but was perceived by many homeowners as an unattainable luxury. However, as consumers learn about the benefits and affordability of roof deicing systems, more and more homeowners in New York, are now finding heated roofs to be a necessity. Safety for family and friends is always at the forefront of our minds. Ice dams and icicles that form in the winter months cause unnecessary hazards that most homeowners aren’t willing to put up with. 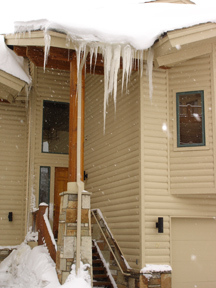 Icicles can easily dislodge, fall, and injure a person standing below. 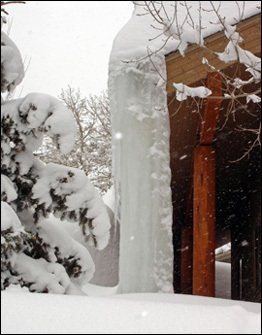 Ice dams cause expensive damage to roofs, and possibly the interior of homes if leaking or structural damage occurs. Installing roof deicing heat cables is a simple and cost-effective way to prevent the winter hazards associated with living in New York. Roof heat can easily be added to your roof eaves, thereby eliminating ice and snow in those areas. Heated roofs keep your home perimeter safe and reduce the risk of costly repairs that come with the destructive powers of winter. Protecting your home, roof, and loved ones with a roof deicing system offers freeze protection throughout the harsh winter months. Many homeowners in New York, New York are praising the peace of mind that comes from the protection that roof snow melting systems provide. Warmzone offers roof heating systems and gutter trace heat cable for all types of applications and roofing surfaces, including new construction, remodeling, or existing roofs. For more information, please call 888.488.9276. A ComfortTile radiant heated floor is a proven, energy-efficient way to stay one step ahead of winter. Most of us have battled soggy sock syndrome during the winter months (you know, the phenomenon that happens when you take your wet boots off at the door), but there’s a sure way to overcome this inconvenient winter mainstay. With a ComfortTile floor heating system warming up your entryway, your feet are more likely to stay dry and warm after you un-boot. These systems consist of thermostat-controlled heating cables under the surface of the floor to provide safe, evenly distributed heat. Because heat radiates up from the floor, radiant floor heat is a highly efficient means for combating cold winter temperatures. heat is clean, quiet and used renewable energy. 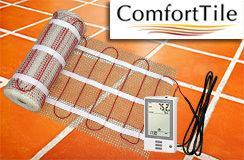 ComfortTile floor heating mat and thermostat. ComfortTile is available in mats or on spools. The mats include a thin heating cable that’s pre-spaced on an adhesive-backed fiberglass mesh for easy installation. They are pre-terminated for use with 120 and 240 volts, heat an area two feet wide, and are available in a variety of lengths. For greater flexibility heating odd shaped rooms and areas, ComfortTile heat cable is available off spools. ComfortTile features a rapid response time and is suitable for heating tile, linoleum, wood, laminates and even carpeted flooring. Having been in an environment that relies on radiant floor heat for providing warmth, I’ve seen and felt its effectiveness first hand. My young boy’s environmentally conscious school recently installed, radiant heated floors, and its effects are impressive. I’m particularly attuned to the performance of the heated floors because I work there in the evening. As fast as I can mop, these floors are drying directly behind me. During winters, as snow accumulates, it’s not uncommon to see a dozen or so snow ensembles such as hats, gloves, coats and snow pants laid out on the school’s heated floor to dry. Despite the abundance of little wet feet, there’s little time for melted snow puddles to accumulate in this environment. Imagine harnessing this same heating power in your home! Using ComfortTile to heat foyers and entryways is a great way to combat the tracking of ice and snow into your home. Radiant heat not only provides a little extra assurance beyond the welcome mat by providing comfortable warmth, but enhances safety by helping to eliminate slick wet spots that are typical during winters. Warmzone is a trusted, leading provider of radiant heated floors for commercial and residential applications. To find out more about Warmzone products, design services and customer support, contact Warmzone at 888.488.9276 or visit www.warmzone.com. Self-regulating gutter trace heat cable is extremely effective and energy efficient thanks to its unique construction. 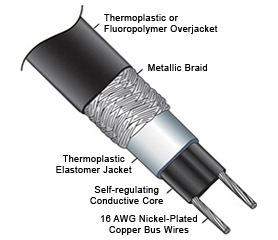 The cable is comprised of a rugged, durable outer jacket surrounding an irradiated conductive core that increases the heat output as outside temperatures fall, and decreases output as temperatures rise. This construction also makes RoofHeat radiant heat cable incredibly resilient in the toughest conditions. The superior outer jacket allows provides greater flexibility and can be mounted to heat roof edged as well as in gutters and downspouts to facilitate runoff. 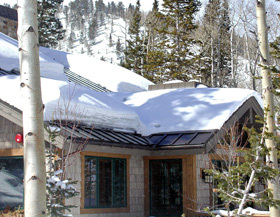 Warmzone roof deicing and gutter trace systems are fully automated and easy to customize. Warmzone roof heating experts will provide a comprehensive system design/layout as well as installation support and even free installation training if you choose. In addition to the self-regulating heat cable, Warmzone roof deicing systems include a snow/temperature sensor and thermostat or controller. Warmzone radiant heat professionals work closely with you to determine the best solution to meet your snow melting needs, power requirements and budget. it can eventually damage your roofing and seep into your home, causing expensive water damage. Ice dams can also be responsible for causing structural decay and rot, or mold and mildew formation in the attic and on walls. Heavy icicles can strain gutters and damage the support pins. No matter how you look at it, damage from roof ice and snow can be costly. A few well placed heat trace cables along your roof’s edge and in gutters and downspouts can serve as an excellent investment in your home. Contact a roof heating expert and learn more about the many roof deicing options that are available. heat trace applications. Warmzone designers are happy to talk with you to discuss the solutions that can best serve your needs. There’s no obligation, so call 888.488.9276 today. As a leading provider of radiant heat solutions, Warmzone has earned its reputation as a trusted industry leader. Having designed systems that have been installed in large refineries, commercial facilities and custom residential applications, Warmzone’s expertise is a valuable asset to businesses or homeowners seeking a reliable pipe trace solution. Warmzone pipe trace systems can be installed for pipe freeze prevention as well as process temperature maintenance installations. The self-regulating heat cable is UL listed and approved for hazardous and non-hazardous applications. It can be used for plastic or metal pipe freeze protection and flow maintenance of pipes, tanks, valves. The self-regulating characteristics of the heat cable means that it automatically varies its power output in response to pipe temperature changes. When the ambient temperature rises, the electrical resistance increases and the consumption of electricity decreases. This ensures energy-efficient operation. The cable will also not overheat or burnout – even when touching or overlapping. Additionally, because of the self-regulating properties, a thermostat may not be necessary in some applications. With the optional outer jacket, the heating cable is resistant to watery and inorganic chemicals and protected against abrasion and impact damage. RHSR is suitable for use in explosion-hazardous areas up to a maximally admissible work-place temperature of +149° F (65° C). Energy Efficient Operation – The self-regulating cable automatically varies its power output in response to pipe temperature changes. When the ambient temperature rises, the electrical resistance increases and the consumption of electricity decreases, ensuring energy-efficient operation. And the cable will not overheat or burnout – even when touching or overlapping. Lower Cost – Less installation cost than steam tracing; less maintenance expense and less downtime. Safe / Durable – Does not overheat or burn out, even when touching or overlapping. Versatile – Suitable for use in non-hazardous, hazardous and corrosive environments. Easy Installation – The cable can be cut to any length required on site (up to max circuit length) so there’s no wasted cable. And the termination, power connection, splice, tee, and end seal kit reduces installation time and requires no special skills or tools. Flame retardant thermoplastic outer jacket protects against certain inorganic chemical solutions. It also protects against abrasion and impact damage. The high-temperature Fluoropolymer outer jacket is used when there may be exposure to organic or corrosive solutions, or vapors may be present. RHSR is UL listed, self-regulating parallel heating cable designed for a variety of industrial applications and environments, including hazardous and nonhazardous. It can be used for plastic or metal pipe freeze protection and flow maintenance of pipes, tanks, valves. For more information about Warmzone’s products and services, call888.488.9276. As we look forward to a warm summer, many residents in the north east are still reeling from the costly effects of record snowfall. Ice dams continue to be winter’s biggest culprit when it comes to roof damage. Warm air slowly escapes from the home and into the attic where it warms the roof, causing snow to melt. As the runoff trickles down the roof, it reaches the eaves. Because the eaves extend out over the edges of the house, there is no warm air from the attic below. In the evening, the runoff will reach the cold eaves and refreeze. There, the ice continues to build up as more snow melts. The wall of ice causes water to build up behind it, refreezing every time the temperature dips below 32°Fahrenheit. When the water pools up behind these ice dams, it can seep into tiny cracks in the roofing material where it refreezes and expands. This repeated process can eventually compromise the structure. Water can slowly work its way into the attic and then drip through the ceiling or down walls. Oftentimes the homeowner is not aware of any problem until significant water damage has occurred. Warmzone offers an ideal way to protect homes and businesses from water damage. 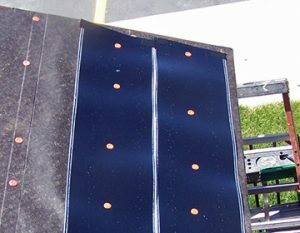 RoofHeat panels feature attractive aluminum panels with self-regulating heat cable. The panels are installed long the roof edge between the waterproof membrane and the shingle. The roof heating panels are supplied in 4-foot lengths and can be cut to length on site. Self-regulating heat cable is channeled through the panel, creating an effective roof deicing system that efficiently warms the roof edges help prevent ice dams from forming. The aluminum panels can also be installed in roof valleys to facilitate runoff. Contact a Warmzone representative at 888.488.9276 for more information on our industry leading roof deicing solutions. There are many options available, and Warmzone will design a roof heating system that is unique to your specific roof heating needs. Call for more information or send us your project details for a free quote. Sid tumbled through the sky at the mercy of the wind. One gust sent him hurling back up towards the gray mist that he’d just departed from, then another would suddenly spin him in a different direction. He tried to catch a glimpse of the ground below as he careened through the stormy heavens, but all he could see was a sky full of his fellow snowflakes, all in the same predicament. Not knowing whether he was going to land in the ocean, on solid ground, or on the backside of a cow, Sid was filled with the angst of an uncertain future. A voice suddenly broke his reflective solitude. “I’ll see you on the ground!” another snowflake yelled to him, seemingly enjoying his carefree flight. “Alright,” Sid responded as he glided closer and closer to earth. “Good luck!” he yelled. Sid knew the chance of seeing this new acquaintance again was slim. Snowflakes that begin their decent together often ended up miles apart by the time they reach the ground. Still, Sid took some comfort in the friendly words and embraced a small sense of reassurance offered by the stranger. Sid was just one of millions who were facing the uncertainty of an unknown destination. This was all part of their cycle of life. The gusty winds subsided during Sid’s descent, and as visibility increased he could make out forms of the approaching ground. Sid’s last journey took him on an exciting adventure in the Pacific Ocean, and he was half expecting the same. During that adventure, he enjoyed seeing a wide variety of exotic marine life, and he even had the experience of rolling across the back of a small humpback whale. But today would be much, much different. There was land below. Not only was there land, there were people! Sid was headed for a city. He had fallen into a small town once before, and though the experience wasn’t horrible, it was far from being his favorite. Being scooped up in a shovel and tossed aside to be splattered by muddy slush from passing cars was something he really hoped he wouldn’t have to endure again. As he drifted towards the ground, Sid could see that many of his peers had arrived earlier, blanketing the uneven ground and buildings with a pristine layer of white. He plotted his landing and prepared for his arrival in the front yard of a small house. But a sudden gust tossed him aside and onto the roof of the house. He breathed a sigh of relief, grateful to be on a roof and not in some cow pasture. He was quickly joined by others, and the group settled in, not yet sure of their fate. After five uneventful days on the roof, Sid started feeling a bit “loosey goosey” as warm air that had escaped from the attic warmed the roof and tickled his rear end. He watched as friends around him collapsed from their frozen state into clear liquid, each letting out a loud “whoo hoo” as they tumbled down the roof valley. They zigzagged their way down the giant water slide before crashing into a growing pool that had formed behind a mountain of snow and ice at the roof’s edge. Then it was Sid’s turn. As his last frozen foothold gave way, he cascaded towards his friends, clumsily bumping into a few stubborn packs of ice before being released into the small pool. This would be Sid’s new home for a few days. The large ice dam wasn’t going to allow any of them to drip into the gutters or downspout anytime in the near future. Apparently, the ice dam had been growing long before Sid’s arrival. The shingles were much warmer higher up on the roof, but the surface near the roof’s edge was much colder. When drops of melted snow trickled down into the freezing valley below, they collected and transformed back into their frozen state. Without the warmth escaping from the attic as it did near the top of the roof, the frozen water would remain where it was, completely at the mercy of Mother Nature. Here it would dwell until the temperature dictated otherwise. The process of melting and refreezing behind the formidable ice dam had repeated several times before Sid had arrived. And now, trapped behind the ice, Sid and his friends would also take part in that process. As night fell on another cold day, Sid and his companions once again changed back into their frozen state. They could do nothing but wait for warmer weather. With each passing day, the crowd grew larger as runoff from warm areas of the roof increased the pool’s size. Milling about like restless concert goers awaiting the opening act, some of Sid’s cohorts grew impatient. “Let’s work our way through this place and drip inside,” he heard one say. Soon, a plan was hatched, and an ample collection of supporters began their unconventional trek. In their liquid state, aided by gravity, they wound their way down through a maze of cracks in the roof. If a crack came to an end or became too small, they would wait patiently for the freezing temperature to grant them their super powers. As they transformed into ice, they expanded with tremendous force, enlarging the existing cracks and preparing a way for them to continue their journey when they resumed their watery ways. With each night and freezing day, the group inched its way through the aging roof. Before long, a trail had been blazed, creating a small stream for others to follow. It didn’t take long for one of the home’s walls to absorb a budding contingent of melted snowflakes. But Sid had no intention of sliding down into the house. The idea of seeping into a home seemed unnatural. Besides, he hated the taste of plaster and drywall, and the last thing he wanted was to become a filament of mildew or mold on a gross, stained wall. He didn’t mind waiting with the others behind the ice dam. Unfortunately, the homeowner hadn’t installed a roof deicing system, which would have prevented Sid’s derelict friends from turning in to a bunch of drips to forge an alternate path into the house. Eventually however, the temperature would warm and melt the ice dam, allowing Sid continue on his way. He’d made this journey once before, resting on a Utah rooftop for over a week before finding his way back to a stream, and eventually back in to the clouds – where he was happiest. Residents in Boston are proud to live in one of the country’s great historical cities, but given its location, Boston is also home to some of the country’s harshest winter weather. As such, Bostonians are typically well prepared for the annual New England snowstorms. Yet, in recent years, even the most seasoned Boston residents have been caught off guard. Snow accumulating on streets and roofs in Beacon Hill, Boston during a blizzard in 2016. 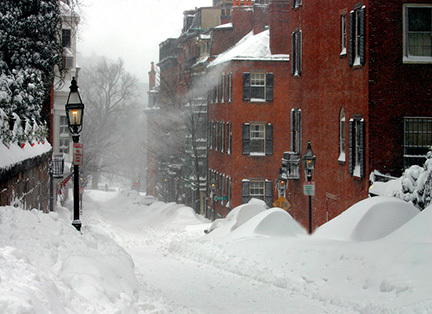 The record breaking snowfall during the winter of 2014-2015 pushed Boston’s snow removal services to the limit and frustrated drivers during a series of heavy storms. With snow totals of 108.6 inches, last year’s snowfall proved to be the most since record books started in 1872. And with heavy snowfall comes additional hazards for residents. Many homeowners felt compelled to manually remove snow from their roofs while building owners in the city worked overtime to ensure that snow and ice buildup on their roofs didn’t break free and threaten pedestrians below. Although efforts were made to enhance the safety of Boston residents, some found themselves to be in the wrong place at the wrong time. In Cambridge, five individuals walking on a path between the Simoni Ice Skating Arena and sports playing fields were suddenly overwhelmed by snow that fell from the roof of the ice rink. One man was buried, but was eventually dug out from the snow without serious injury. This incident brings to light the unseen hazards of snowfall in large cities. State law mandates that property owners not only clear their sidewalks for pedestrians, but also take reasonable steps to prevent snow and ice from falling onto pedestrians from roofs and other elevated structures. The ideal solution has proven to be the installation of an automated radiant roof deicing system. Roof heating systems are also beneficial for Boston homeowners. Easy to customize and install, roof deicing and gutter trace systems can keep heavy ice from damaging roof gutters and prevent ice dams from forming along roof edges. 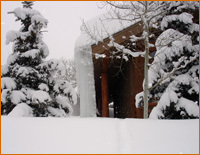 The repair costs from ice dams can be significant. As heat rises and warms the roof, water runs down to the roof’s edge. But the roof is colder at the overhang, and the water refreezes. As this process is repeated, ice and water can build up behind the dam where it can seep into tiny cracks of the roof. Each night, as the water refreezes, it expands, paving the way for more water to seep into the cracks and eventually into the home. The resulting water damage within walls and ceilings can be expensive to repair. Warmzone roof deicing and gutter trace systems offer one of the best roof heating solutions available for preventing hazardous ice dams and heavy icicles from forming on roofs. In addition to Warmzone’s large variety of industry leading roof deicing systems, Warmzone radiant heat experts work closely with customers to determine the best and most affordable option for the roof. The most popular roof heating system features an advanced polymer heating element (RoofHeat STEP) that can be installed directly under roof shingles. This low-voltage system has proven to be a favorite roof heating solution among professional installers and homeowners throughout New England. Heat trace cable can also be installed to heat gutters and downspouts, or the systems can be combined to produce optimum results. Warmzone professionals are experts when it comes to roof heating, and its customer service is second to none. In addition to providing complete system designs (AutoCAD), installers have access to free installation training as well as personal installation support. If installers encounter any issues or have any questions during the process, he/she can speak with one of the dedicated installation support staff to resolve the issue. Many home and business owners in Boston are already enjoying the benefits of a Warmzone roof deicing system. Call a Warmzone consultant to learn more – with no obligation or sales pressure – at 888.488.9276. As an industry leader, Warmzone offers one of the most informative radiant heating websites available. Visit warmzone.com and learn more about radiant heating systems and why some systems (and services) are better than others when it comes to heating specific projects. After record snowfalls this year, a spring assessment of your roof may lead you to consider a radiant roof heating solution, particularly for your roof valleys and edges. Heating these trouble spots is a great way to prevent damage as a result of ice dams and seepage. With a razor thin element, superior heating capability and inherent flexibility, a low-voltage RoofHeat STEP roof deicing system is the ideal option for heating roof valleys and edges. 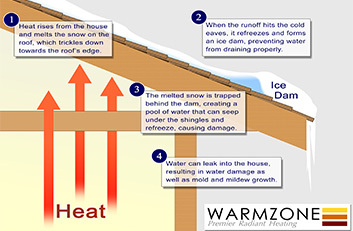 Warmzone roof deicing systems can eliminate costly ice dams, the number one source of roof damage. Because the eaves and roof edges do not have any heat warming the roof from below, they’re much colder and prone to ice buildup from snow melting higher on the roof. 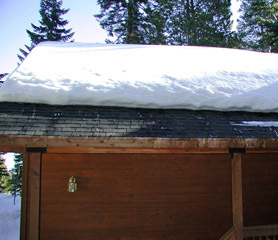 As snow up higher on the roof melts, the water freezes when it reaches the colder eaves, creating an ice dam that forces water to back up behind it. With nowhere to go, the water seeps through roof decking and refreezes again at night, expanding small cracks where the water eventually works its way down onto ceilings and walls, resulting in costly water damage and mold. The RoofHeat STEP roof deicing system is fast becoming the roof heating system of choice among professional roofers. Unlike other radiant heating options, the heating element used for this system is not a cable, but rather a thin polymer that can be nailed, stapled and cut on site, so it’s easy to work with and install. The self-regulating semi-conductive polymer heating element is Mylar coated to resist damage from alkaline or salt, and can be mounted under the shingles for discreet heating of roof valleys and edges. Installing a roof deicing solution now can preserve and protect a new roof installation from snow and ice buildup for years to come. Besides saving you big bucks in the “improve, repair and replace” department, a RoofHeat STEP roof deicing system can save you the time and effort of having to manually remove snow and ice. These fully automated systems feature an activation device/snow sensor that detects precipitation and temperature. When conditions warrant, the sensor signals the controller when then sends power to the heating element to heat your roof. A RoofHeat STEP roof deicing system can keep roof valleys and edges clear and dry before, during and after a major snow event. The system also consists of a transformer that steps down high voltage to low voltage while controlling a specific section of the roof deicing system. During system operation, the transformers monitor power and output to the heating element to ensure safe, accurate and efficient performance. To find out more about this industry-leading roof deicing system, call 888.488.9276 and speak to a Warmzone professional today. Finally spring has arrived, along with the drip, drip, drip of melting snow from the roof tops onto the pavement below. As meteorologists predict several more years of extreme winter weather, now may be the time to add a RoofHeat radiant gutter trace system to your list of home improvement projects this spring. Heavy snow and ice can damage roof gutters and downspouts, and ice dams often result in costly roof and water damage. Keeping gutters and downspouts clear of ice helps to facilitate runoff which dramatically reduces the risks to your home. When gutters and downspouts are blocked, and there is nowhere for the precipitation above to go, melted snow can pool up on your roof or run over the ice and drips down onto the ground. As this ice builds up along your roof edges during winter months, it can melt and refreeze several times, leading to roof damage and water seepage inside your home. Now for some good news—a Warmzone gutter melt system is a truly efficient, affordable home improvement project that can keep your gutters and downspouts free and clear from ice and snow buildup every winter. The backbone of the system is Warmzone’s durable self-regulating roof deicing cable, one of the most recommended roof heating solutions available for roofs, gutters and drain pipes. (See what separates Warmzone’s self-regulating heat cable from the competition. Self-regulating RoofHeat cable is constructed to be safe, durable and extremely efficient. 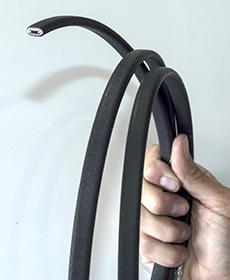 This energy-wise cable has an irradiated conductive core that increases the heat output as the outside temperature falls, and decreases heat output as the temperature rises. With a rugged, durable outer construction, the heat cable can withstand harsh conditions for continuous use during the winter months. RoofHeat deicing cable is part of a fully-automated gutter trace and roof deicing system designed to keep roof gutters and trouble spots clear of snow and ice buildup. A self-regulating heat cable system is controlled by automatic sensors capable of detecting when snow is on the way. Once detected, the sensor signals the control unit, activating the snowmelt system only when necessary to keep gutters and downspouts clear of ice and snow. The system is fully automated so there’s no switches to flip the system on or off, and operates only when you need it. These systems are customizable and can accommodate virtually any size, type and construction of your roof. And self-regulating roof deicing cable can also be combined with other recommended Warmzone systems such as theRoofHeat STEP deicing system to create an optimal solution for you. For more information on installing a RoofHeat radiant gutter trace and deicing system to protect your roof next winter, call a Warmzone pro at888.488.9276.